Do you have questions for Chief Judge Crabtree? About his career and experience as a Provincial Court Judge and as the Chief Judge of the Court? About his leadership and the Court’s many initiatives? About judicial appointments, judicial education, reducing delays, or …? You’ll have an opportunity to ask him yourself, in two weeks’ time. Clicklaw will also be at the event in support, to answer any questions about public legal education and information (PLEI) in BC, contributor organizations, and more! 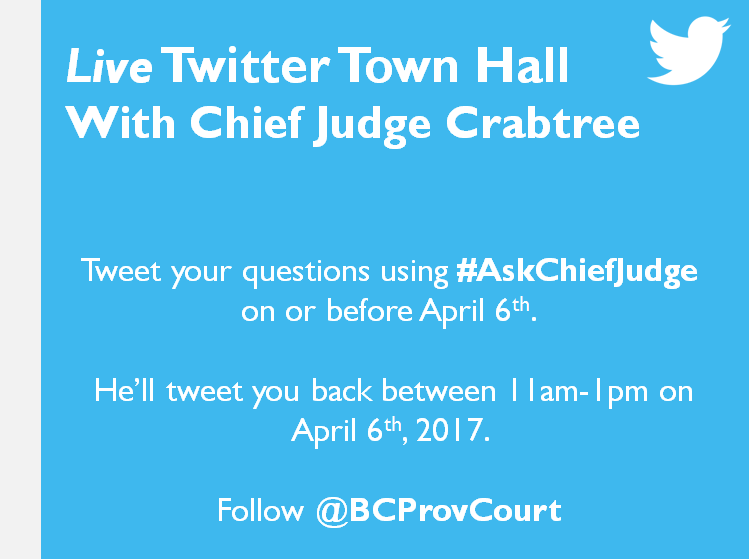 Tweet your questions using #AskChiefJudge on or before April 6, 2017. He’ll tweet you back between 11am-1pm. Please note that the Chief Judge can’t discuss individual cases or political issues, and may not be able to answer all questions during the Town Hall, but efforts will be made to answer outstanding questions on the Court’s website after the event. Answers will also be available at #AskChiefJudge. Here’s a Throwback Thursday to last year’s first ever Twitter Town Hall: See the post that gave a recap of all the events.